Sometimes the best thing to do when watching a film is to take a deep breath, and let it gently flow over you like water. It’s easy to become part of the modern quick-edit machine and become impatient, when a film is moving at a leisurely pace. This cinematic impatience is something I don’t suffer a lot of, myself. God knows, I’m impatient when a computer boots up slowly, or someone meanders along in front of me, when I need to get somewhere quickly. When it comes to a ‘slow moving’ film, however, I go into a sort of passive trance, happy to take it minute-by-minute and drink it all in. Andrei Tarkovsky’s Soviet film Solaris is best viewed in a patient, relaxed state. One of the true classics of Science Fiction, it’s a work of art for the mind, not the adrenaline system. Tarkovsky lingers on glorious scenes of nature, and quiet states of thought. We can spend as many wordless minutes gazing at a patch of water-weed gently waving under a stream, as watching a dead woman re-animate back to life. Nonetheless, it’s all equally wonderful.The plot is fairly straightforward but provides an excellent skeleton to overlay the flesh of philosophical thought, emotions and marvelous visuals. Psychologist Kris Kelvin (Donatas Banionis) spends his last day on Earth walking among the gardens and streams of his childhood home, contemplating his life, and farewelling his father and step-mother. He then leaves for Solaris, a distant planet around which circles a space station sent from Earth. Originally a successful mission, the ‘Solarists’ have depleted in number from hundreds to three, and the Solaris program has fallen apart. Kris is sent to find out what is going wrong for the remaining crew, and why no progress is being made scientifically. He may have to recommend the ‘liquidation’ of the project. Upon arrival – we never see his actual journey – he finds the space station in disarray and neglect. One of the scientists, Doctor Snaut (Jüri Järvet) is present when Kris turns up, but seems distracted and disheveled. Another, Doctor Sartorius (Anatoly Solonitsyn) hides away doing research and the third, Doctor Gibarian (Sos Sargsyan) has committed suicide prior to Kris arriving. Gibarian, a friend of Kris’s back on Earth, had earlier recorded a video, but fails in his attempts to explain what drove him to take his own life. A mysterious young girl appears in the video, and also appears to Kris, wandering around the station. Sartorius reluctantly appears – preventing a dwarf from escaping his laboratory, which we see for a split second – but is of little help, and the mystery deepens. One night Kris’s wife Hari (Natalya Bondarchuk), who had also died of suicide years ago, appears to the startled man. Sensing the planet’s sentient ocean responsible for this physical apparition, he tricks her into a rocket and blasts it into space, badly burning himself in the process. Snaut explains that this ocean-with-a-mind has created these ‘guests’ from the human’s consciousness while they sleep. Why is this happening? Perhaps the ocean is trying to understand these humans in its midst by communicating via emotions. They always come back, and the ‘copy’ of Hari will return. She does, and Kris, over time, finds himself falling in love with the Solaris Hari more than he ever did with the Earth one. At first reacting in a blind panic when Kris is not around – including tearing herself to quickly-healing shreds by clawing through a metal door to get to him – eventually Hari becomes more ‘human’, and independent of Kris. In the meantime, Gibarian and Snaut have devised an ‘annihilator’ that could possibly destroy the neutrino-based ‘guests’, but at the moment have decided to take another tack – to beam Kris’s entire brainwave patterns at the ocean to help it understand them, and stop tormenting them with these ghosts from their memories. At a very makeshift ‘birthday’ for Snaut, the arrogant Gibarian calls Hari a copy of a human, a matrix, nothing more. This upsets her greatly, and Kris comforts her. Though later Kris and Hari have a romantic moment in zero gravity, she drinks liquid oxygen in despair, and dies. Minutes later the dead woman revives in spasms, with a great display of physical acting by Natalya Bondarchuk. Kris tries to calm the distressed woman again and explain about her past life on earth. Years ago, Kris did not show enough love to the depressed woman – and probably never loved her, but ‘now he does’. Now he wants to stay on the station forever with her. Soon Kris falls into a fever, and Hari comforts him. As he sleeps, there appears to be multiple Haris, and his old dog in the room. He dreams of his long-gone mother soothing his wounds, and awakens to find Hari gone. Snaut gives him a letter explaining that Hari consulted with ‘the others’ and decided it was best that she disappears. She asked Snaut and Gibarian to use the annihilator on her, after which she vanished completely. Sadly adjusting to life without Hari, Kris needs to decide whether to descend to the Planet’s surface, which is now forming islands, or return to Earth. We find him visiting his father in his old country house, but soon realise that this is a reality created on an island of Solaris, as we pull back and see the roiling sea of the planet. 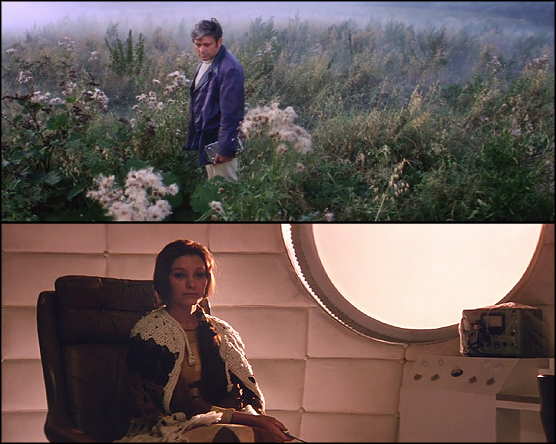 Tarkovsky has given us much to ponder, with Solaris. The nature of what it means to be human, indeed, of human perception itself. For what is another person to us, but our mental understanding of them? Solaris the creator only knows what Kris knows about Hari. Although strangely, Hari doesn’t seem to know that her Earth version killed herself, and presses Kris for answers about her past. The Solaris Hari considers herself human, no matter what the hard-hearted Gibarian says. If you have human feelings and emotions, then surely you are human, even if you are entirely composed of neutrinos. The film itself is a wide-screen visual feast with glorious colours, and the director and cinematographer Vadim Yusov have clearly put thought and detail into every frame. I particularly enjoyed the nature-based scenes, as Kris stands in contemplation of his Earthly home – although by film’s end we may be some doubt as to whether we were ever on Earth in the first place. Another highlight for me was the zero-gravity moment, where Kris and Hari share a brief interlude of romantic grace, objects floating around them in smooth and sympathetic orbits. Performance-wise, the actors are all fine in their roles, with Natalya Bondarchuk as Hari, the standout performance for me. With little facial expression, she can convey the inner turmoil of her character, as she moves from being a ‘newborn’ to a fully realised human being in pain and despair. Her spasmodic movements, as she resurrects from drinking the liquid oxygen, show an actress as physically invested in her role, as she was emotionally. Donatas Banionis as Kris is dour and emotionally dulled throughout, but shows a subtle and growing intensity as the film progresses. I was quite touched by the dream-reunion with his mother, where he seems genuinely, tearily, affected by the moment. I’ve heard the author of the source novel, Stanislaw Lem, was not happy with the final film, feeling it avoided the exploration of humans trying to communicate with aliens. Solaris appears to be more about the alien intelligence trying to communicate with humans through emotions, to the radical extent that a human is fully created. If you like your Science Fiction to take the cerebral route, then I can only recommend Solaris to you. It’s lush, beautiful, thought-provoking, slow and sad. There are no laser fights or evil aliens in sight, but it’s still an entertainment operating at a high level. It’s more like a warm, green pool to dive into and explore the sights beneath the surface, than a sparkling box of shiny science confections. It left me with images on my mind for some time, and you may find the same. I can’t wait to watch other Tarkovsky films such as Andrei Rublev, Mirror and Stalker, and present the experience of each as soon as possible.